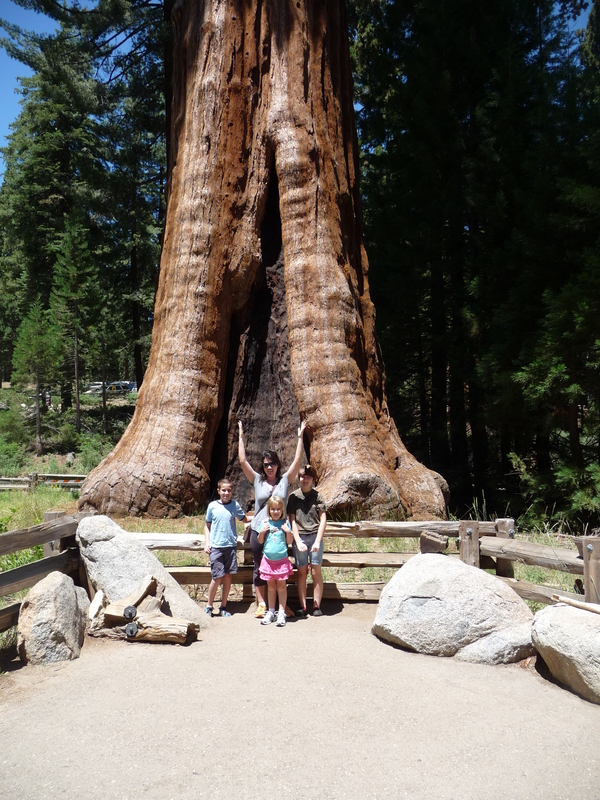 After our sojourn to CalArts, we decided to go up to the Sequoias to see the big trees. We stayed the first night at a Best Western outside of the park, then went inside. The plan was to camp. We made reservations at a campsite, the only campsite available. It was about 20 miles away from the entrance we used, but we figured we could see some things one day, go up to our camp, and it wouldn’t be a big deal. It was hot. I mean it was 103. My appendages swelled up immediately and I immediately had to join the queue for the ladies room inside the park. It was packed, of course. Tons of Europeans. I haven’t seen so many Europeans since I was actually in Europe. Not that I’m complaining, just an observation. 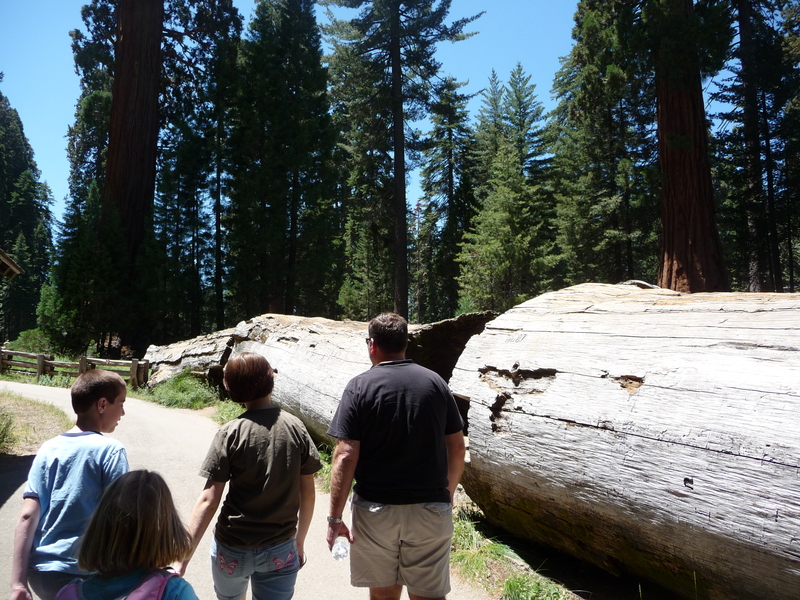 First we saw some really big trees. “No, its antennae are too long to fly,” he said. Of course it then flew up and Son started screaming (glee) and a lady screamed and ran away (terror). Camera wouldn’t completely focus on it and then it flew. 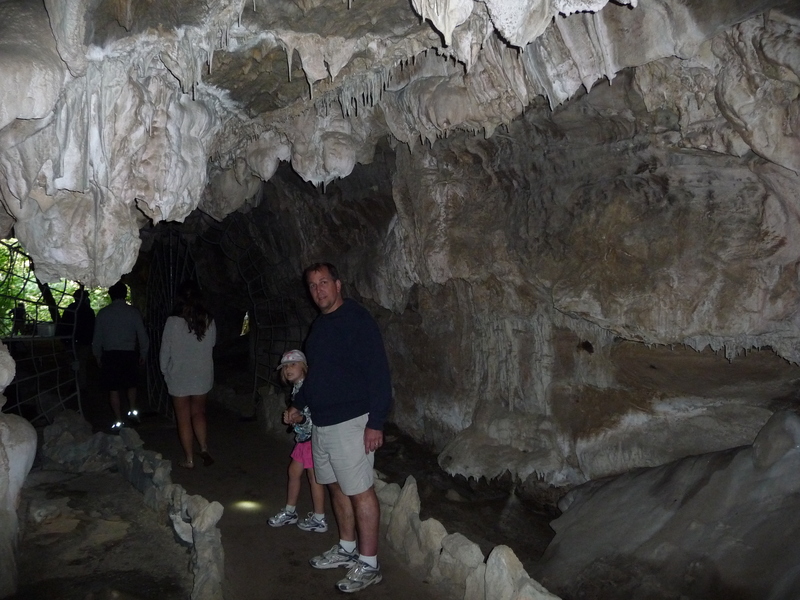 We decided to go to Crystal Caves, for which you need to buy a ticket on site. The first available was 4:30 that day. We were faced with a dilemma. The cave tour would last until 6:30 or so. It would take about 3 hours to get to the campground, according to the ranger. So we realistically wouldn’t be able to make camp until 10 that night, or skip going to Crystal Cave. 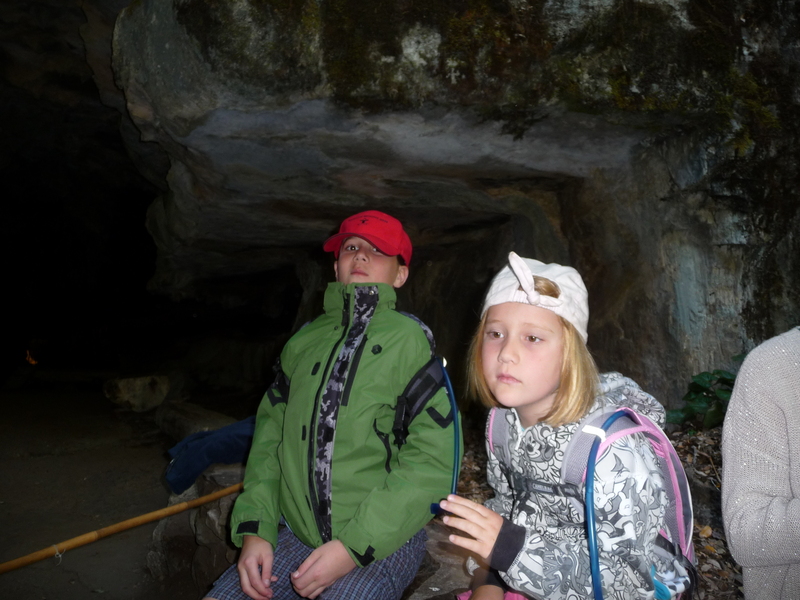 We chose to go to Crystal Cave. The hike down to the cave is a half mile. 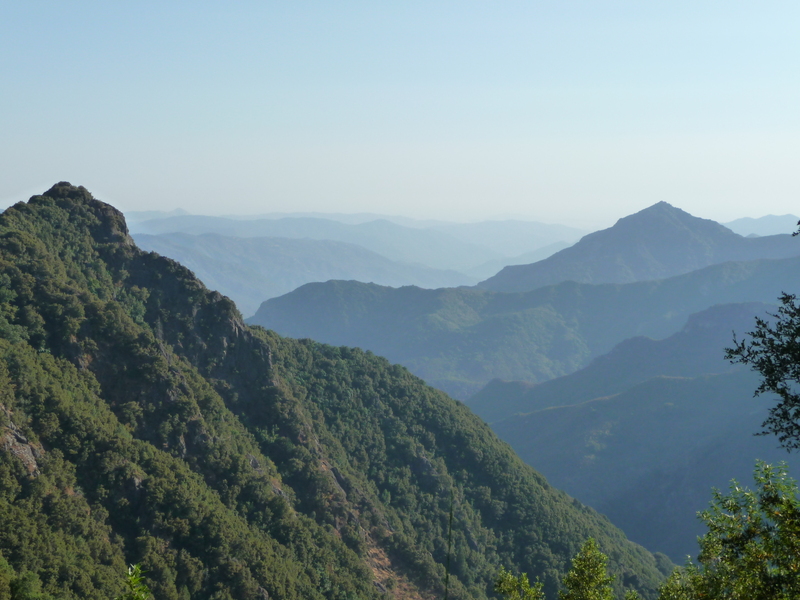 It smelled like artichokes in the canyon, and there is a big waterfall. 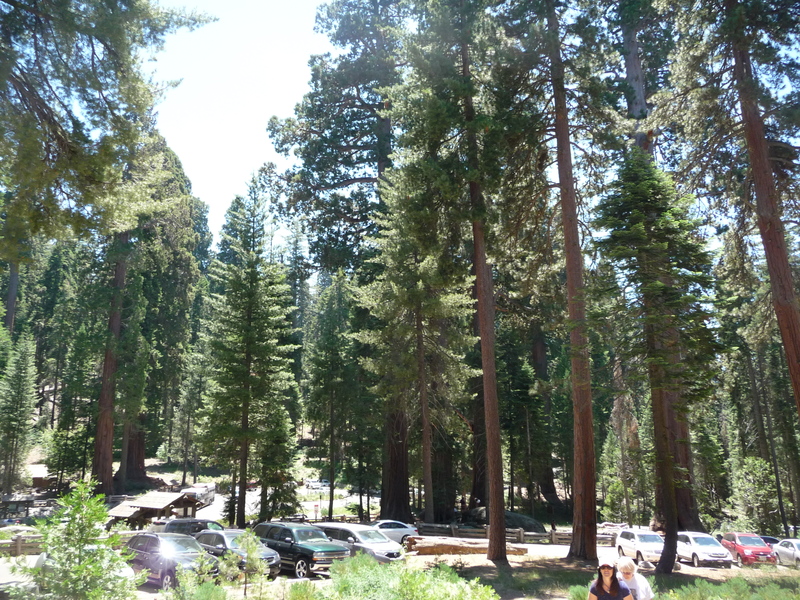 They told us to put our food from the car into bear lockers, though I’m not sure if a bear would venture to a parking lot filled with 100 cars and even more humans in the middle of the day. Inside the cave it was only 59 degrees, so we brought jackets. And flashlights. They had lighting, but it was still dark. Then Mitch led our group of 50 inside. 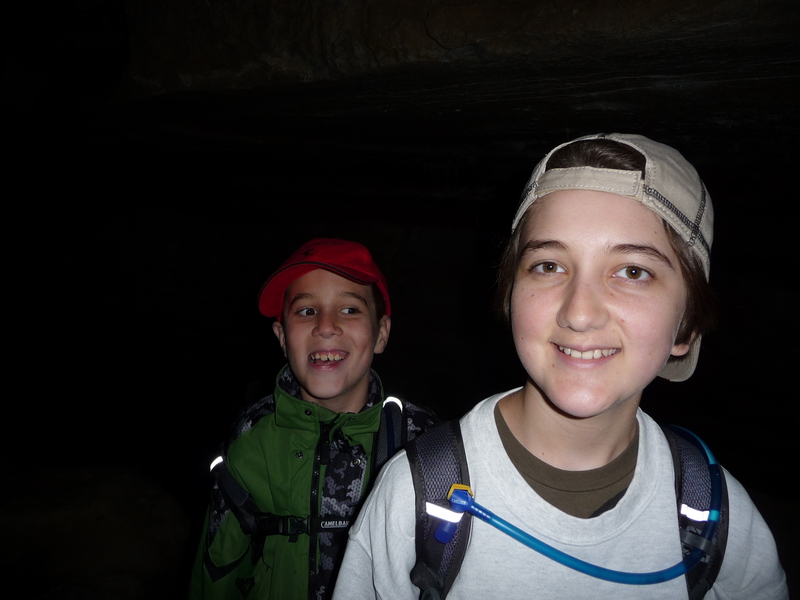 He explained that there are parts of the cave where nobody is allowed, because it’s a Native American burial ground. Which might explain the orbs in the Great Room (orbs=ghosts according to some). 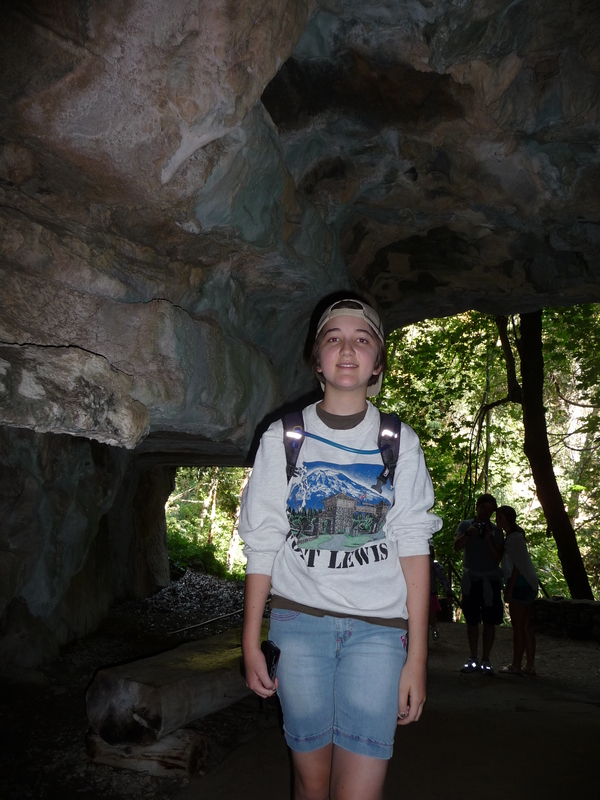 There was an underground river and I was terrified that we’d lose one of the kids over the edge. 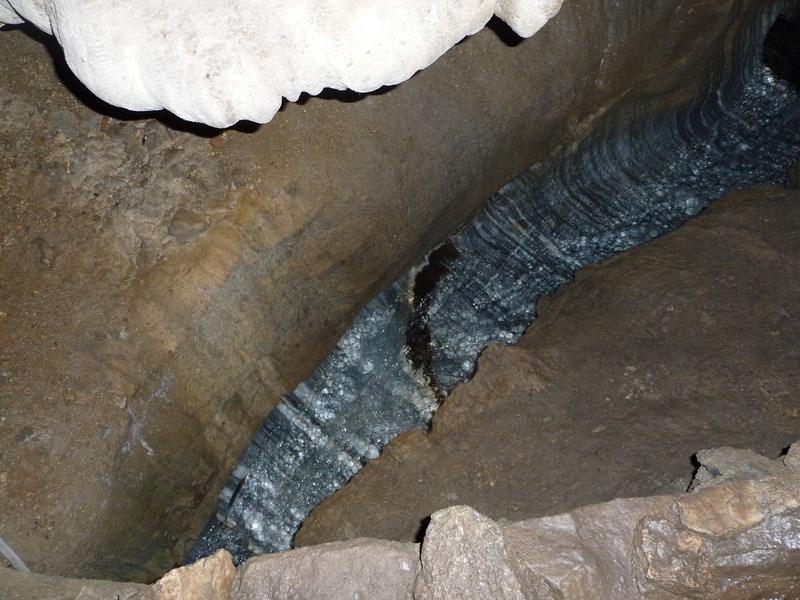 He also told us there’s a big lake in a cavern below the tour. We also got to experience total darkness, which unfortunately was not also total silence since 2 out of 3 of our kids did not like that one bit. 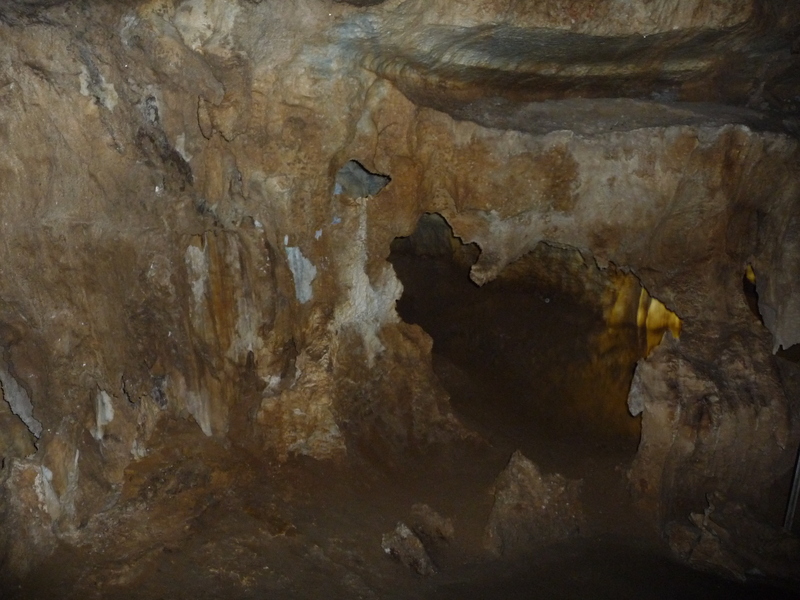 The cave formations are a form of marble. Interesting. Mitch picked something up and Son said, “What’s that you have?” Mitch said, “I usually don’t like to show people this because then everyone will want to see…” and he looked at Son, who would not let him off the hook, and showed him an insect. He said it was a “Muirepede,” named after John Muir. 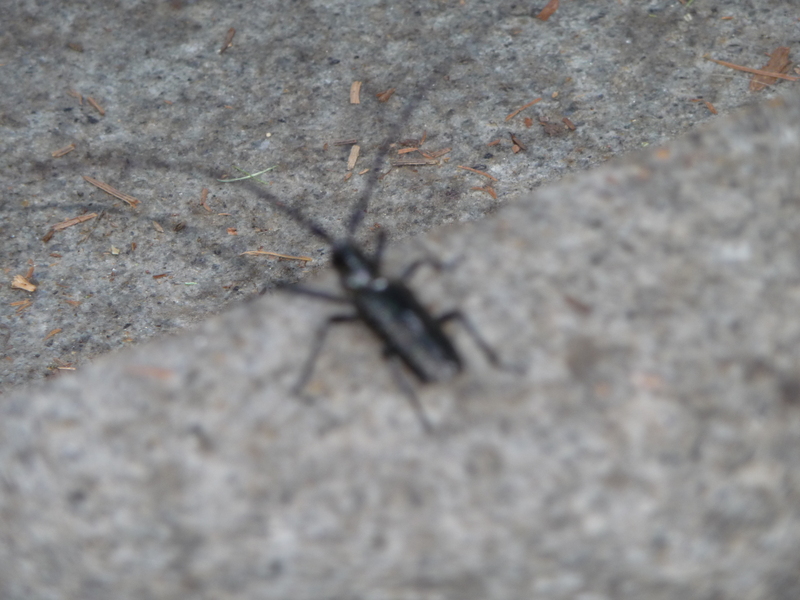 It has long antennae and no eyes and hates light, so I got no picture of it. The walk up was strenuous, especially going from 59 degrees to 100+, but we powered through. Then it really was 6:30 and we realized the kids could not handle a 3 hour drive (neither could we). We started back down the mountain. They’re re-doing the roads, so there is a 30 minute delay on top of it going either way. I took some pics during the delay. The road was windy, and Son said he wasn’t feeling so well. He can’t chew gum because of his orthodontia, so I offered him crackers, which he refused. We were just about to the bottom when there was a noise like water being spit out and I knew he’d lost his cookies. “I didn’t even know that was going to happen!” he said. Um, that would have been nice to know. I would have made him take Dramamine. (I said as much, but maybe not so nicely). Anyway, that was a mess, but we cleaned up once we reached a turnoff (which was a ways off). We continued down. Then there was another weird noise, different. Metal on asphalt. “What’s that noise?” Eldest said. “Look in the rearview and see if our tire’s blown,” Cadillac told me. He’d checked the tires before we left, but it was worn out on the inside where you’d have to reach your hand all the way inside to feel it. So now he knows to check that. We pulled off near a campground and he put on a spare. Some people offered to help but Cadillac declined. By then it was 8 and nobody had eaten and there was now absolutely no way in heck we were going camping. So we returned to the motel where we’d stayed and everybody slept in. Then the next morning, we went over to Costco in Visalia and they had our tires in stock and got us on the road in an hour. We went home. 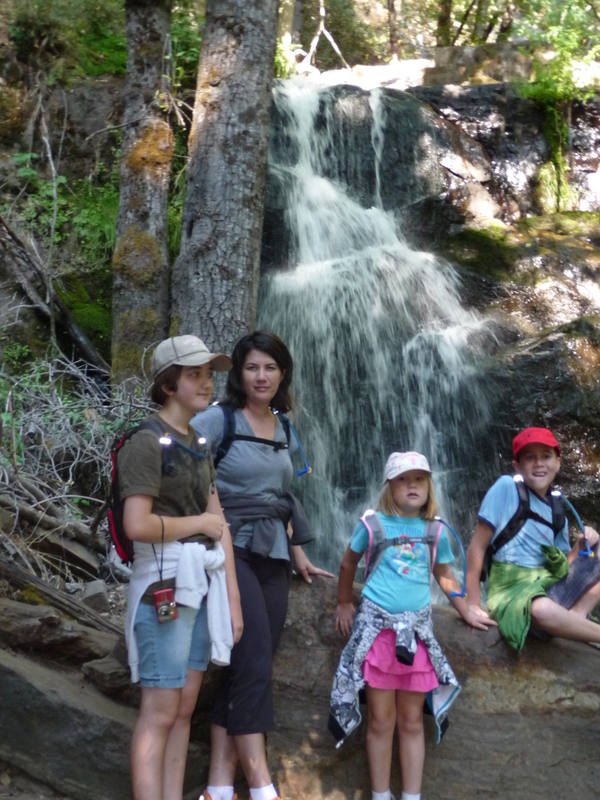 “Every time we try to go camping, it never works,” Eldest said. This is true. But Cadillac promised to take them to a local place next month for fishing. Our youngest had some gems I wrote down. “He is like a dentist for tires.” About the tire guy and his tools. Anyway thanks for sharing. Loved the pics. Cool cave.